Always up for a kitchen challenge, I wanted to take it a step further and figure out if I could make a homemade frothable vegan milk without soy. As you can see in the photo of my (decaf) Earl Grey tea latte, I did it! With my recipe below, you can too. In a high-speed blender, process both ingredients for 1 to 2 minutes. In a standard blender, process for 2 to 4 minutes. Test for smoothness by rubbing a little milk between your thumb and index finger. If it feels mostly smooth and creamy, with very fine bits of pulp, it’s done. If not yet, blend for another minute or so. After blending, pour contents through a nut milk bag or very fine mesh cloth placed in a strainer, suspended above a wide-mouthed container. Gently squeeze the milk from the pulp for a perfectly smooth texture. Refrigerate for 3-5 days. To froth: In a small saucepan, heat the amount of milk you want until small bubbles begin to form (don’t let it come to a boil). Then, submerge the frother just below the surface of the milk and circle the edges of the pan for about a minute as the froth forms. 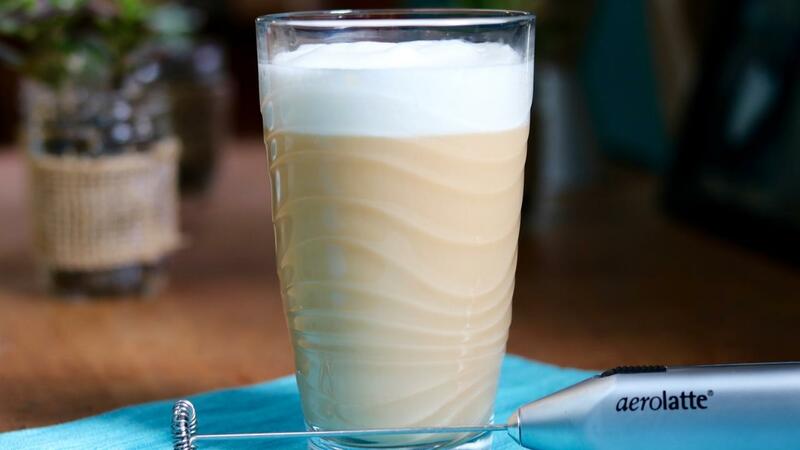 To serve: Use a spoon to hold back the froth as you pour in the milk and then dollop froth on top of your drink. Enjoy!